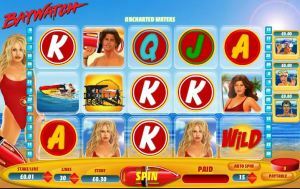 It’s what you’ve all been waiting for, Baywatch the slot game, and it has been brought to you by one of our favorite online casino software development houses, Playtech. Everything from the design of the background to the symbols on the reels is perfectly themed and all of your favorite characters are there for you to spend slightly too long staring at, barring one huge omission of David Hasselhoff. Don’t think that all of the effort has gone into the visual design of the game though. The game play is quick paced, fun packed and genuinely exhilarating with a boot load of special bonus features and games. There are 5 reels and 20 paying lines, which doesn’t sound all that exciting at first but when you take account that there an incredible 5 bonus features I’m sure you can appreciate the potential for winnings in this game. You can place bets ranging from as little as 20 pence, all the way up to a staggering 500 pounds per spin for a chance to win many thousands your stake back. The most exciting bonus feature of this game is probably the free game feature which is triggered when you hit three Baywatch scatter symbols across the reels. Hit this and you will be rewarded with 12 free spins and the middle reel will become stacked with lifeguard symbols. What does this mean to me you ask? Well, once the middle reel is stacked with lifeguard symbols there are three bonus features that become activated. The Caroline Holden feature will reward you with 6 more free spins, a triple multiplier and wild symbols will appear stacked in reels 2,3 and 4, massively increasing both your chance of winning and the pay out. The Neely Capshaw feature will give you 10 times your initial stake bet, 6 free spins and a 2 times multiplier. The Matt Brody feature once again awards free spins, 6 of them in this instance and Matt Brody himself acts as a wild symbol. It’s probably worth mentioning that scatter symbols are also still in play and useful during these bonus features, hit three of them and receive an extra 12 free spins. It’s Free Spin City up in here. Still not enough bonus features for you, why not take a foray into the Rescue Bonus feature as well? This is triggered when a rescue feature symbol appears on the 5th reel and you can then choose between playing the C.J. Parker Re-spins feature or Lifeguard mini bonus feature. In the Re-spins feature you will be awarded with 1 extra re-spin and up to four wild symbols will appear across the reels. In the Lifeguard feature you will be shown 15 lifeguard symbols covered by sand and your job is to uncover and match 3 of them to win a prize. If you want to play Baywatch on the go, you’ll have to play in the browser of your phone – there is as yet no mobile version. You’ll find Baywatch at BET 365, Ladbrokes, Videoslots and Omni Casino, to mention but a few. The visuals are great and are sure to fill any Baywatch fan with nostalgia, even if they have omitted arguably the most famous character, the Hoff, and the game play is fast paced and exhilarating. The potential winnings are large and the frequency of scatter symbols and wilds as high. There really is very little not to like about Baywatch from Playtech.